"The advantage of the app that uses the optical sensor is that it can check for an irregular pulse multiple times throughout the day in the background, without needing the user to actively engage the application," said Marco Perez, Assistant Professor of Cardiovascular Medicine at Stanford and one of the principal investigators of the study. With a strong demand for health-centric devices, using smart phones, watches and other "wearables" has become a routine experience for many Americans, with over 75 percent of the population owning a smartphone. The ability of a smartwatch to potentially identify an arrhythmia, which is when the heart beats too slowly, too fast, or in an irregular way, is of significant public health interest: AF affects between 3 and 6 million people in the United States; if left undiagnosed or untreated, AF can lead to the development of heart failure or other complications, including stroke. If AF is suspected, participants are alerted through a notification system on the Apple Watch and the Apple Heart app. Following an irregular pulse notification, study participants proceed to a telehealth video visits with a study doctor - all through the app - and receive an ECG monitoring patch to be worn to confirm the diagnosis of AF. In the event of urgent symptoms (such as chest pain, or shortness of breath), participants were directed to their local urgent care or emergency room facility for medical evaluation. The nation-wide implementation of this study gave participants access to medical attention if needed, helping ensure participant safety. "We now have access to high-quality sensors that can measure and detect changes in our bodies in entirely new and insightful ways without even needing to go to the doctor, but we need to rigorously evaluate them," said Mintu Turakhia, Associate Professor of Cardiovascular Medicine at Stanford and the other principal investigator of the study. 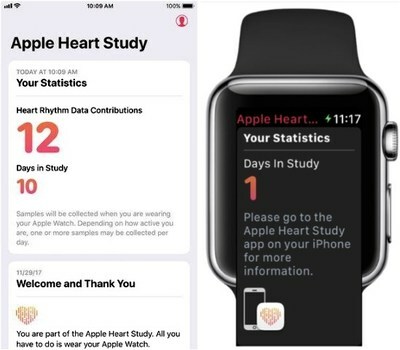 The article is "Rationale and design of a large-scale app-based study to identify cardiac arrhythmias using a smartwatch: The Apple Heart Study," by Mintu P. Turakhia, Manisha Desai, Haley Hedlin, Amol Rajmane, Nisha Talati, Todd Ferris, Sumbul Desai, Divya Nag, Mithun Patal, Peter Kowey, John S. Rumsfeld, Andrea M. Russo, Mellanie True Hills, Christopher B. Granger, Kenneth W. Mahaffey, Marco V. Perez (https://doi.org/10.1016/j.ahj.2018.09.002). It appears in American Heart Journal, published by Elsevier. Copies of this paper are available to credentialed journalists upon request; please contact the Elsevier Newsroom at newsroom@elsevier.com. Journalists wishing to interview the authors may contact Tracie White at traciew@stanford.edu or +1-650-723-7628. The American Heart Journal will consider for publication suitable articles on topics pertaining to the broad discipline of cardiovascular disease. Our goal is to provide the reader primary investigation, scholarly review, and opinion concerning the practice of cardiovascular medicine. We especially encourage submission of 3 types of reports that are not frequently seen in cardiovascular journals: negative clinical studies, reports on study designs, and studies involving the organization of medical care. The Journal does not accept individual case reports or original articles involving bench laboratory or animal research.